If there is one type of game you rarely see anymore, it has to be the good old fashioned rail shooter. 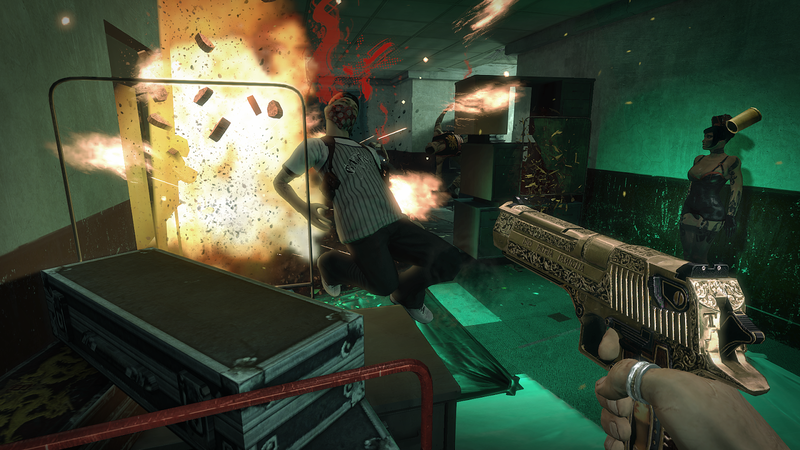 Blue Estate for the Xbox One is one such game. The game is based off the comics of the same name created by Viktor Kalvachev with the game developed by HeSaw. The story is centered on clueless private detective Roy Devine as he tells the story of Tony Luciano and Clarence. The story is completely ridiculous and over the top but that is kind of the point. In a way, it is just like a Michael Bay movie, so turn off your brain and just enjoy the spectacle and carnage. 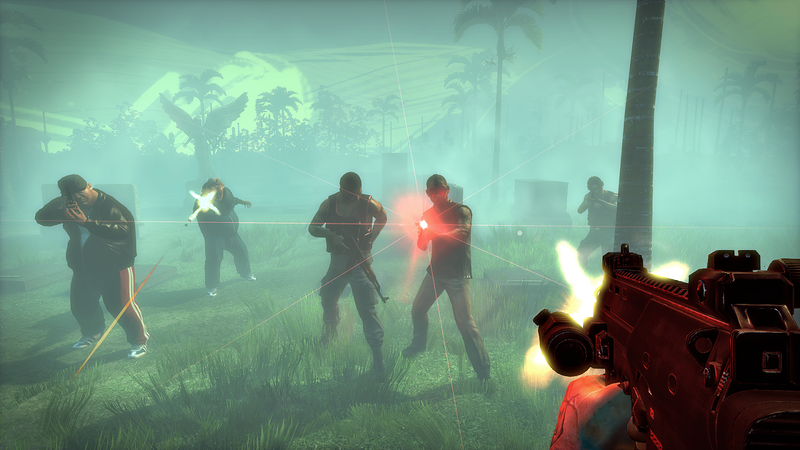 Since Blue Estate is a rail shooter, the only thing you actually have control over is where and who you are killing. You control the aiming cursor with your right stick and fire with the right trigger, like in the majority of shooters, and you use the left stick to pick up ammo, health and perform other quick gestures. The pistol with unlimited ammo is given to you at the beginning of every level and each level has a unique secondary gun you can obtain that can dish out death even faster. The story mode consists of seven levels with six of them visiting a very different location than the previous. Ever dream about killing mobsters in a foggy graveyard? Or perhaps daydream about storming your local golf course and headshotting everyone there? Then this game just might be for you. During each level you are rewarded with points depending on how you kill (headshot, nutshot, etc.) with a combo meter that keeps going up as long as you keep killing. The trick to obtaining super high scores is to keep that combo meter going for the entire level and watch as you get hundreds of thousands of points for just a mere headshot. Headshotting fools in this game is strangely satisfying. It never got old for me. While the story levels are quite long (for a rail shooter anyways) with some of them ranging around thirty minutes, the arcade levels are extremely short. We’re talking three minutes short. But that's quite ok because arcade mode is all about speed. You have to be extremely fast and have quick reflexes to obtain the top ranking in this mode. The game isn’t very long. A playthrough of story mode will only take a couple hours but it does offer multiple difficulties and leaderboards to chase. I’m going to be honest and admit that I had very low expectations for this game before I played it. But the more and more I played, I realized I was having quite a good time. I really enjoyed Blue Estate. The story is ridiculous but in a good way, the humor hit more than it missed, and it just felt good killing all those mobsters. I feel the game is priced appropriately and if anyone is looking for a fun diversion killing fools, then I can absolutely recommend Blue Estate. What I played: 15 hours completing 3 playthroughs of Story Mode (Normal, Hard, 4 Stars), 1 playthrough of Arcade Mode obtaining 'S' Rank on each level, and collecting 27/27 achievements. A code was provided by the developers. Nice review Rand, really like your writing style. Hope to see more!